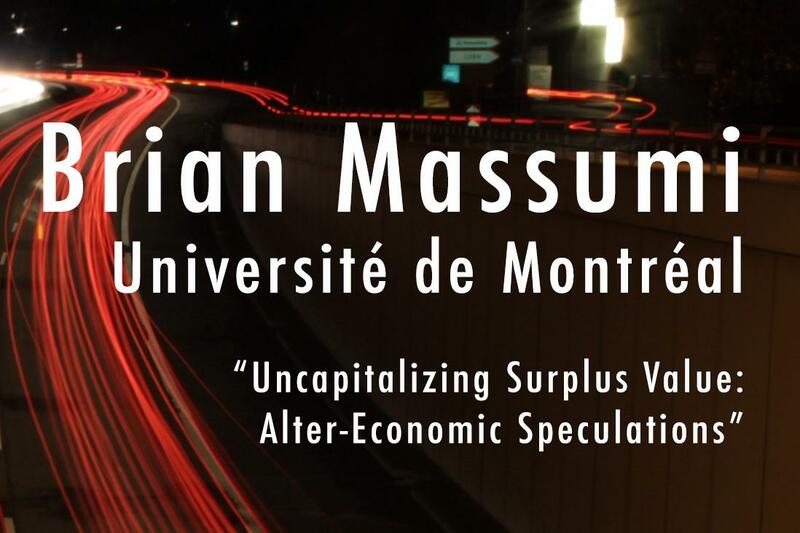 Brian Massumi: "Uncapitalizing Surplus Value: Alter-Economic Speculations"
*Please register at altereconomic.eventbrite.com to receive a link to the seminar reading. Brian Massumi will lead a seminar at the Franklin Humanities Institute. After registering, attendees will receive a link to download his essay "Virtual ecology and the question of value," which he asks be read in advance. Dr. Massumi will speak informally from the essay and describe some alter-economic experiments in which he is currently involved. Interjections from the audience will be welcome at this seminar-style talk. This event is cosponsored by the Department of Romance Studies at UNC-Chapel Hill and the Humanities Futures initiative @ the Franklin Humanities Institute. Dr. Massumi will also be giving a public lecture at UNC the previous day, at 4pm on Monday, April 23, 2018, titled "Immediation: The Being of Relation." The talk will be in Toy Lounge, Dey Hall, 4th Floor. We hope you can join us for both events!